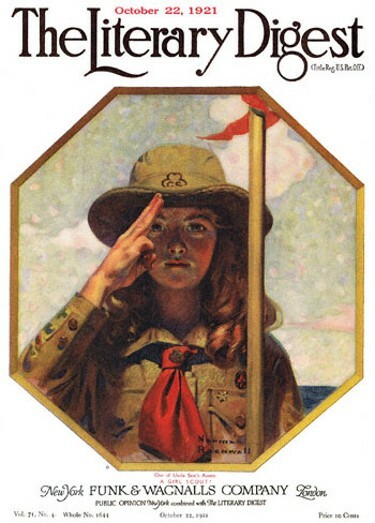 One of Uncle Sam's Assets - A Girl Scout, this Norman Rockwell painting, appeared on the cover of The Literary Digest published October 22, 1921. The alternate title for this illustration is Girl Scout Saluting. This illustration was Rockwell's thirty-first picture featured on the cover of The Literary Digest. Rockwell artwork was featured on the cover of The Digest a total of twelve times just in 1921. A Rockwell cover was published every month in 1921 just on this one magazine alone! The original oil on canvas painting, 17.5 x 16.5 inches or 44.5 x 42 cm, is part of a private collection. Norman Rockwell elicits patriotic feelings with this painting. One of Uncle Sam's Assets - A Girl Scout was only one of 47 Norman Rockwell Literary Digest covers; here is the list of more Norman Rockwell Literary Digest scans. This Girl Scout is showing the Girl Scout Salute. She is using proper form with the three middle fingers extended and thumb and pinkie finger across the palm. We assume that she is saluting an American flag. She appears to be holding a Girl Scout flag on a pole with her left hand. She is a proficient Girl Scout. She has badges on her sleeves and pockets. On a more technical note, the horizontal line of the horizon and the vertical line of the flagpole create the balance felt in this painting.